(Lexington, Ky.)--Superior Home Improvements is excited to announce that it has joined hands with WLEX-TV/LEX 18 to air its second-ever television commercial. The 30-second commercial, which shows video clips of numerous Superior Home Improvements project sites from the Central Kentucky area, discusses not only the services that the company offers, but also its professional qualifications and corporate responsibility. The commercial is currently airing on WLEX-TV/LEX 18, and can be viewed online on the Superior Home Improvements YouTube Channel and social media accounts. (Winchester, Ky.)--Superior Home Improvements is proud to join hands with the Lexington Bluegrass Association of Realtors to volunteer Saturday at its annual Repair Affair, a yearly event at which individuals and businesses throughout the Central Kentucky area work together to improve the homes of low-income elders and/or disabled homeowners who are unable able to afford much needed exterior home repairs. This year, the Repair Affair will offer exterior remodeling upgrades for eight homes throughout Central Kentucky, and will receive assistance in roofing, gutters, soffits, landscaping and miscellaneous groundwork from members of the Superior Home Improvements crew. Superior will work on a home in Winchester, Kentucky alongside a diverse listing of not only individual volunteers, but also business volunteers from industries across the entire corporate spectra. (Winchester, Ky.)--Superior Home Improvements is proud to announce its Renovation, Repair, and Painting (RRP) certification from the U.S. Environmental Protection Agency (EPA), a title that qualifies companies as lead-safe certified, and enables them to conduct renovation, repair and painting activities in target housing and child-occupied facilities. The certification, which was officially received June 28, 2013, will represent one of many industry, government and charitable affiliations of Superior Home Improvements. (Winchester, Ky.)--Superior Home Improvements is proud to announce the successful conclusion of its latest commercial project, a roofing installation at the Winchester City Hall. Located in the center of Winchester, Kentucky, the Winchester City Hall can be spotted from a distance by the large bell tower that sits atop its roof. Members of the Superior Home Improvements roofing and exterior remodeling crews installed a shingle roofing system on the building throughout the final weeks of June. Alongside the Winchester City Hall, Superior Home Improvements has completed a variety of commercial projects throughout the Central Kentucky area in recent months, including a large-scale installation of commercial exterior trim at Shriners Hospital in Lexington, Kentucky. To view all of the recent projects completed by Superior Home Improvements, click here. 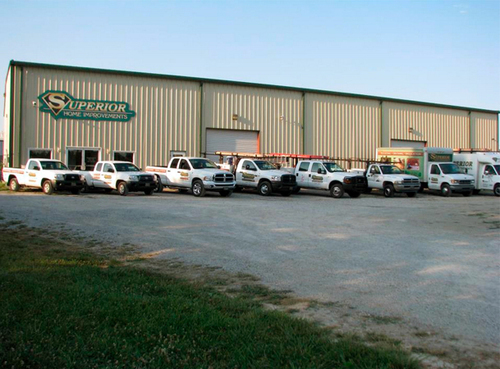 Headquartered in Winchester, Kentucky, Superior Home Improvements has served as a provider of high-quality home remodeling for more than twenty years. With specialties in various types of roofing, AttiCat blown-in insulation, vinyl replacement windows, vinyl siding, gutters, decking, additions and box gutter replacement and installation, Superior Home Improvements is dedicated to serving its customers with results and integrity of the utmost quality. (Lexington, Ky.)--Superior Home Improvements is proud to announce the successful conclusion of its most recent large-scale commercial project at Shriners Hospital in Lexington, Kentucky, an exterior endeavor that spanned throughout the course of several weeks. Beginning in March, 2013, Superior Home Improvements joined hands with a variety of Central Kentucky’s most talented construction and building companies to contribute to the hospital’s ongoing exterior renovation project. Members of the Superior Home Improvements remodeling and roofing crews were chosen specifically for the installation of the facility’s commercial exterior trim, an endeavor that, when completed, ensures continual stability, strength and protection against harsh weather and damage. To learn more about the beginning stages of this project, click here to read the Superior Home Improvements announcement article. (Winchester, Ky.)--Superior Home Improvements is excited to begin distributing Kindles to homeowners and business owners of Winchester, Kentucky who took advantage of the May, 2013 “Get a Roof, Get a Kindle” promotion advertised in the current edition of the Winchester Town Money Saver. By pursuing projects between the first and last of the month, any individual who purchased a minimum of 20 square-feet in roofing or roofing repair services received a free Kindle from the Superior Home Improvements home office. The promotion will continue to run through May 31, 2013, and its details can be found on the front page of the Winchester Town Money Saver. For further information regarding the promotion, contact Superior Home Improvements here.